Yogurt is an important component of the Mediterranean diet. The benefits of yogurt are well known and documented and so far have not been disproved by any dietician or nutritionist. Greek Yogurt is a special category of yogurt and the benefits of Greek yogurt are also documented, well understood and approved by all. Yogurt is part of the Mediterranean diet, is one of the many and healthy Mediterranean foods and it is also a part of the Mediterranean cuisine and it is included in many Mediterranean recipes not only for foods but for deserts as well. So the combination of Greek yogurt and Mediterranean diet is expected to have positive results on our health. What do we mean by Greek Yogurt? When we talk about Greek Yogurt people may think that we talk about yogurt of Greek origin and because Greece is in the Mediterranean diet they associated automatically Greek yogurt with the Mediterranean diet. In reality however, when we talk about Greek yogurt we mean the yogurt which is prepared the way Greeks made and still make yogurt. This method is nothing else than the straining of yogurt. Greek yogurt is strained yogurt. The process of straining yogurt gives two important advantages or benefits to Greek yogurt. We remove the extra water and whey of the yogurt and we increase the percentage of proteins contained in the quantity of yogurt that we eat. So Greek yogurt is really healthier than regular yogurt, without implying off course that regular yogurt is unhealthy by any standards. The sales of Greek yogurt have increased dramatically over the past few years and many Greek yogurt brands have appeared in the market and this is no coincidence. People have been educated and have understood the benefits of Greek yogurt. In order to fully understand the benefits of Greek Yogurt we should understand the nutritional benefits of Greek yogurt and how we can structure our nutrition around Greek yogurt and ensure that we will get the full benefits of Greek yogurt nutrition. Greek yogurt has to offer a lot to our health and we will certainly be healthier should we include Greek yogurt in our everyday diet. You should note that we use the term diet in the same sense as it is in the Mediterranean diet, the way of living, and not in the sense of deprivation of food for the purposes of weight loss. Calcium: Greek Yogurt being a dairy product is rich in Calcium. Calcium is a basic component in your diet which responsible for your bone and teeth formation and health. But this is not all. Calcium is essential for the smooth operations of your heart. Arrhythmia is one of the side effects of the heart functioning in the case of low calcium intakes. 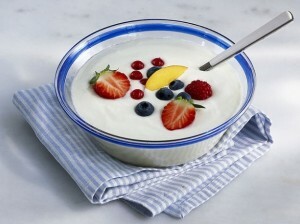 Protein: Greek yogurt is a Mediterranean diet food which is rich in proteins. It all comes in the way Greek yogurt is prepared. It is strained yogurt and the percentage of protein in any given quantity is higher than regular yogurt. The amount of protein contained in a serving of any Greek yogurt brand is similar but not the same. The average content of protein in 6 ounces of Greek yogurt is 14g. Greek yogurt is great not only for those who follow the Mediterranean diet but for the vegetarians as well since Greek yogurt can satisfy their daily intake of protein without the need of any supplements. Sodium: Sodium is a component of salt and it is naturally present in all foods so the Greek yogurt could not be an exception. Sodium is responsible for high blood pressure and the recommended sodium intake of Sodium is 1,500mg. Greek yogurt is low in sodium. 6 ounces of Greek yogurt contain about 80mg of Sodium thus making Greek yogurt a safe food to be consumed by anyone, even those suffering from high blood pressure. Sugars: Greek yogurt contains sugars. Low fat Greek yogurt contains about 7mg of sugars in 6 ounces of a serving while the regular Greek yogurt may contain up to 24 mg. Sugar is a carbohydrate and it is a healthy component of our diet. It is the source of energy and is needed for the proper functioning of cells and muscles. Natural sugars are part of a healthy diet. Greek yogurt contains the right amounts of sugars and for diabetic people the low fat yogurt is the recommended type of Greek yogurt to be included in their balanced diet. You have to remember that most of the sugars are removed through the straining process through which extra whey is removed. Cholesterol: 6 ounces of plain Greek yogurt contain about 50g of cholesterol while the low fat Greek yogurt contains zero cholesterol. The amount of cholesterol in your body depends on your diet and physical activity. Too much cholesterol in your body can lead to heart diseases. Greek yogurt however contains the minimum amounts of cholesterol and it is a kind of food well suited for all diets. Lactic Acid Bacteria, Acidophilus: While most of bacteria are harmful, acidophilus is one kind of bacterium which is beneficial to our health. Acidophilus is naturally found in the digestive tract of mammals and it is found in dairy products and especially yogurt. Acidophilus is a bacterium which helps us to have a good digestive and reproductive tract and in addition to this it prevents or fights human cancers. So this is one more reason to include a portion of Greek yogurt in your diet and this may be the reason that people who follow the Mediterranean diet, which has yogurt as one of its daily components, have low cancer incidents. Greek Yogurt is a food which can be consumed as part of your breakfast, as an in-between snack or even as your end of the day meal. It can be eaten plain or with any kind of fruits or cereal. Greek yogurt can also be part of any meal as a side dish or used in any of the delicious recipes widely available in any Mediterranean diet recipe book. It is certainly to your benefit and for your health to include one serving of Greek yogurt in your everyday diet. I would like to incorporate Greek Yogurt into my diet, but don’t know how to determine whether the yogurts in the supermarkets are Greek or not. Can you give me some pointers and the names and brands of Greek Yogurts.